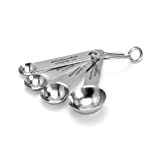 Precisely measure spices and ingredients with these KitchenAid Gourmet Stainless Steel Measuring Spoons. This set of 4 includes: 1/4-, 1/2-, 1 teaspoon and 1 tablespoon sizes. Each cup is expertly crafted from quality stainless steel to resist rust. These measuring spoons provide accurate measurements. The large print sizes are easy to read. These measuring spoons are dishwasher safe for fast and easy cleanup. 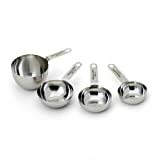 This set of 4 includes: 1/4-, 1/2-, 1 teaspoon and 1 tablespoon sizes. Each cup is expertly crafted from quality stainless steel to resist rust. These measuring spoons provide accurate measurements. The large print sizes are easy to read. These measuring spoons are dishwasher safe for fast and easy cleanup. 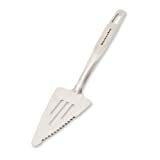 Serve all your favorite pies quickly and easily with the KitchenAid Gourmet Stainless Steel Pie Server. The sturdy, stainless steel construction resists rust. The wedge shaped head makes serving slices easy. The solid, stainless steel construction is easy to clean and never needs polishing. A hole in the ergonomic handle allows convenient hanging storage. This pie server is completely dishwasher safe for easy cleanup. The sturdy, stainless steel construction resists rust. The wedge shaped head makes serving slices easy. 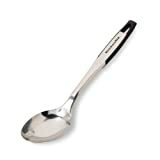 The solid, stainless steel construction is easy to clean and never needs polishing. A hole in the ergonomic handle allows convenient hanging storage. This pie server is completely dishwasher safe for easy cleanup. Get cooking with the KitchenAid Gourmet 5-Quart Stainless Steel Colander. This colander features a 5-quart capacity. A molded plastic lip around the top edge allows for easy handling. The many perforations allow for quick rinsing of fruits, vegetables and more. Drain liquid away from your food quickly and efficiently for easier kitchen prep. A non-slip base prevents sliding on countertops. 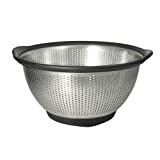 This colander features a 5-quart capacity. A molded plastic lip around the top edge allows for easy handling. The many perforations allow for quick rinsing of fruits, vegetables and more. Drain liquid away from your food quickly and efficiently for easier kitchen prep. A non-slip base prevents sliding on countertops. 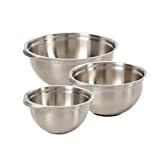 Prepare meals and deserts with this set of KitchenAid Stainless Steel Mixing Bowls. This set includes 3 bowls; one 5-quart, one 3-quart, and a 1.5-quart. Made from heavy gauge 18/8 stainless steel that will resists rust. An oversized handle provides a comfortable yet secure grip. A soft non-slip base ensures stability while mixing. These bowls are dishwasher safe for easy cleanup and trouble-free maintenance.One year hassle-free replacement and lifetime limited warranty. This fine product is warranted to be free from defects in material and workmanship. For one year from date of purchase, under normal use and care, KitchenAid will replace these products free of charge, if they are found to be defective in material or workmanship. In addition, from year two through the life of the products, any piece found to be defective under conditions of normal use and care will be repaired at no charge or replaced with the same item or an item of equal or better value. For more information call the KitchenAid Customer Satisfaction Center toll-free at 1-800-541-6390 or visit our web site at www.KitchenAid.com. The KitchenAid Gourmet Stainless Steel Soft Basting Spoon is perfect for dipping, pouring and serving your favorite meals. The soft grip handle provides a comfortable grip. This basting spoon features a generous size bowl for dipping and serving. The ergonomic handle includes a built-in loop for hanging storage. The rust-resistant, stainless steel construction is strong and durable. This basting spoon is completely dishwasher safe for easy cleanup. One year hassle-free replacement and lifetime limited warranty. One year hassle-free replacement and lifetime limited warranty. This fine product is warranted to be free from defects in material and workmanship. For one year from date of purchase, under normal use and care, KitchenAid will replace these products free of charge, if they are found to be defective in material or workmanship. In addition, from year two through the life of the products, any piece found to be defective under conditions of normal use and care will be repaired at no charge or replaced with the same item or an item of equal or better value. 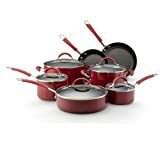 For more information call the KitchenAid Customer Satisfaction Center toll-free at 1-800-541-6390 or visit our web site at www.KitchenAid.com.